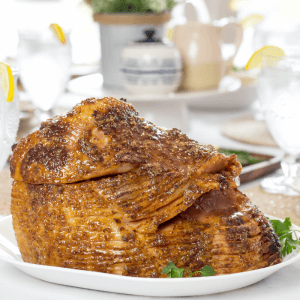 Mustard Glazed Ham is a bone-in, spiral cut ham baked with glaze made from honey, brown sugar, ham drippings and stone ground mustard. After that Air Fryer Salmon with Brown Sugar Glaze from last week, I decided that a similar recipe for ham needed to be done with the upcoming Easter holiday around the corner. I wanted the glaze to have great mustard flavor with a touch of sweetness that roasted up beautifully. 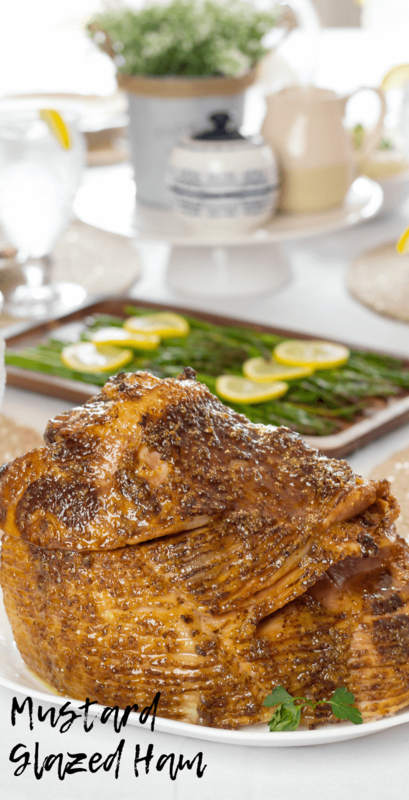 This Mustard Glazed Ham really works and makes a gorgeous main course on your holiday table. 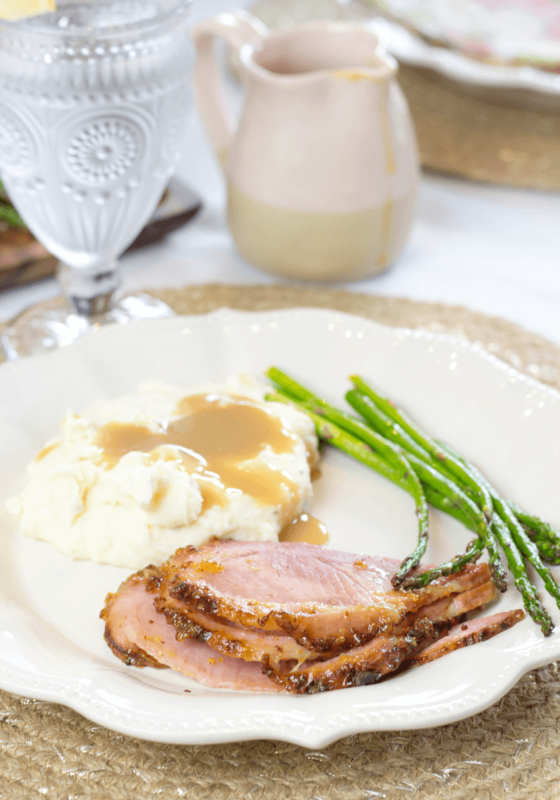 We pair this ham with Cream Cheese Mashed Potatoes, gravy and Roasted Asparagus. Simple, traditional, gorgeous food- that’s what it’s all about. I really focused on pulling that mustard flavor out with this Mustard Glazed Ham. Expect that little mustard kick with each glazed bite! It is really delicious. My ten-year-old asked if I could just give him “end” pieces because it was tasty. He just wanted to eat the glaze and I can’t even blame him. Instead of having the ham baste in its juice, we are cooking it in a roasting pan. This means we will need to count on steam to keep moisture inside the ham. Steam comes from water so put 1/2 cup of water in the bottom of your roasting pan and you can go ahead and add any extra ham juices leftover from the packaging. You can’t steam well in an open area. Right? Think of a hot shower in a small bathroom. When the door is closed, their is crazy steam. When the door is open, there is virtually no steam. We all know this. Same applies in the oven. Create a small area to steam the ham like a closed door while showering. That aluminum foil over the top of the ham needs to be fitted tightly with the roasting pan. Be mindful not to over-cook the ham. Most hams are already cooked meaning we just need to re-heat. Pick a bone-in, pre-cooked, spiral-cut ham in the 8-10 pound range. Now, bake 10 minutes for every pound. An 8 pound ham would cook for 80 minutes and a 10 pound ham would cook for 100 minutes. 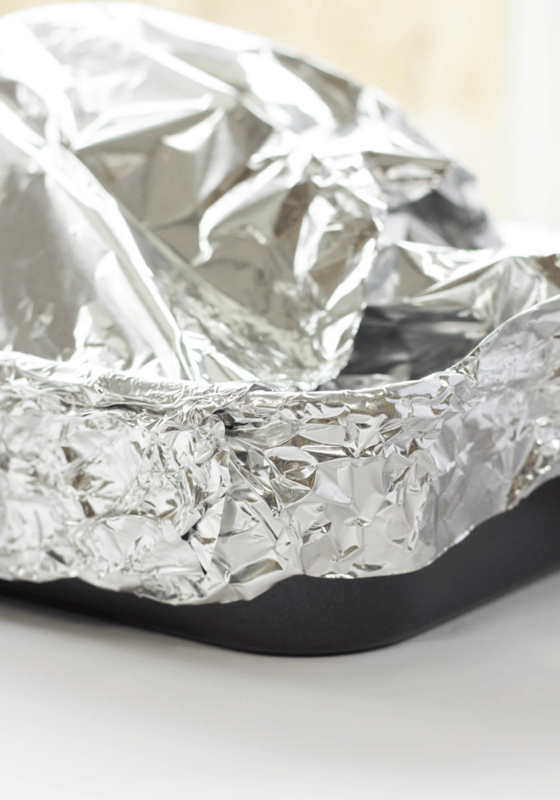 Once the ham is cooked, you crank the heat, remove the foil and pour the glaze on to roast. Note that you can cook a larger ham if needed. Adjust your cook time accordingly using the 10 minutes per pound calculation. Place the ham onto the rack in a roasting pan. Add 1/2 cup of water to the bottom of the pan. I also like to add in extra ham juices from the bag the ham came in. Wrap the the top in aluminum foil. Make sure you have a tight wrap where the ham can steam inside. Bake for 10 minutes per pound. My ham was 8 pounds so I cooked it 80 minutes. When there is 20 minutes left for your ham to cook, begin the glaze. 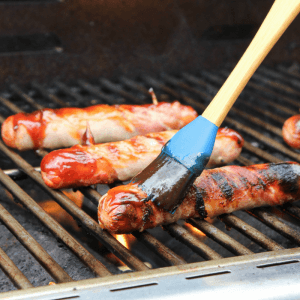 Using a basting syringe, pull 1/2 cup worth of ham drippings and put the liquid in a non-stick pan on the stove-top. Make sure to cover the ham back up well. Along with the ham drippings, add honey, stone ground mustard and brown sugar. Bring the glaze to a low simmer and let simmer for 5 minutes. Set to the side. 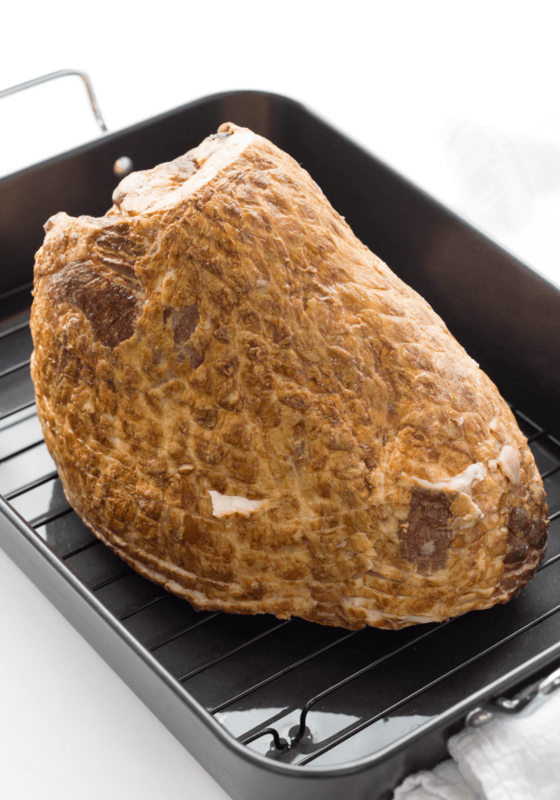 After the ham has cooked, take it out of the oven and raise the oven temperature to 425 degrees. Remove the foil and pour half the glaze over top of the ham. Return to the oven for 10 minutes. Leave the foil off. Pour the rest of the glaze over top and cook another 5 minutes. Remove from oven and let rest 10 minutes before serving. You may substitute butter for pan drippings to create your glaze. 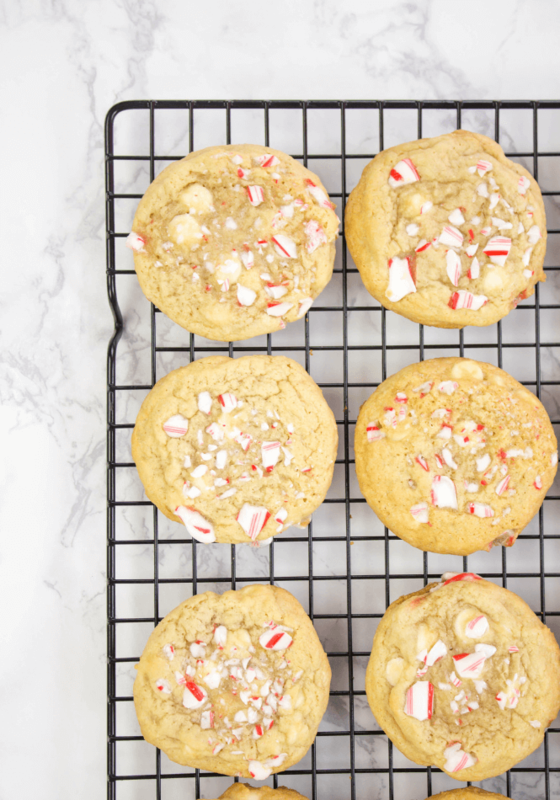 Candy Cane White Chocolate Chip Cookies are made with basic baking ingredients, white chocolate chips and crushed candy cane bits for a festive treat even Santa wants to sneak in this holiday season. Cookies are made a lot in my home this time of year! Between the holidays and gatherings with co-workers or friends and cookie exchanges and treats for the kids- a whole lot of cookies are being baked. 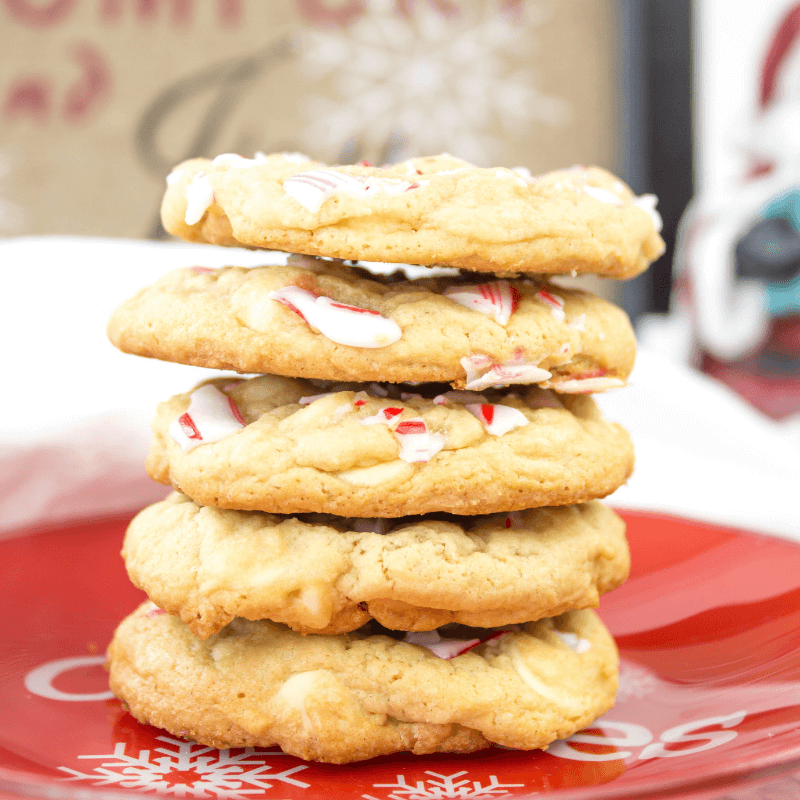 These Candy Cane White Chocolate Chip Cookies are perfect for any holiday occasion but we especially love these for Santa on Christmas Eve. 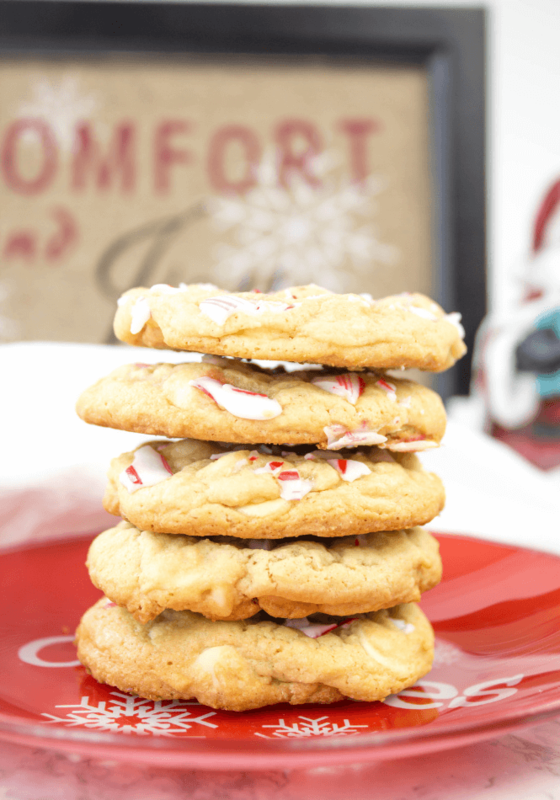 Candy Cane White Chocolate Chip Cookies are everything you love in a cookie. 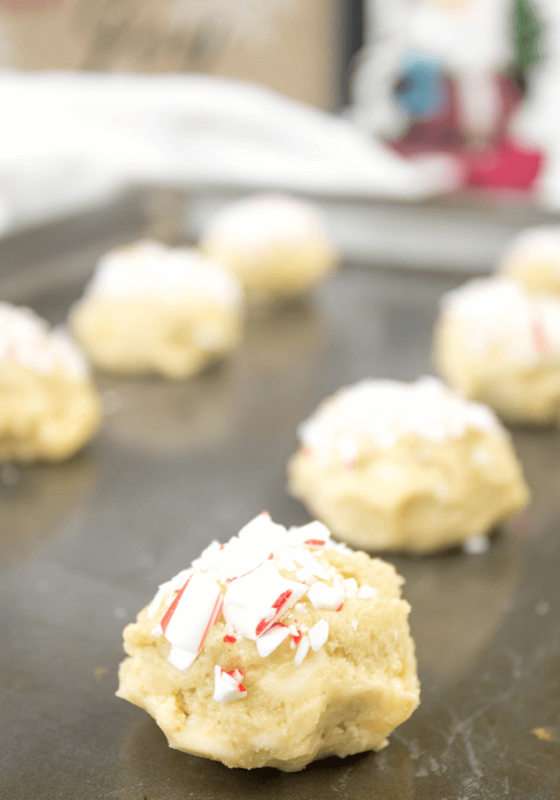 These are soft and chewy with chocolate bites and the added candy cane on top give them another layer of flavor and extra color to brighten up your holiday. Start by crushing the candy canes into bits. I do this by placing the candy into a storage bag and paddling them with a rolling pin. Set them to the side while you mix the cookie dough. In a large mixing bowl, add softened butter, brown sugar and granulated sugar together. Use a hand or stand mixer to beat until creamy and smooth. Add the vanilla extract and eggs. Beat again and then add salt. Dissolve the baking soda in some hot water and add to batter. Beat while slowly adding in the flour. Once you have a good consistency, fold in the chocolate chips and place the cookie dough in refrigerator for 30 minutes. Preheat oven to 350 degrees. Use a cookie scoop to place batter onto baking sheet giving space between each cookie. 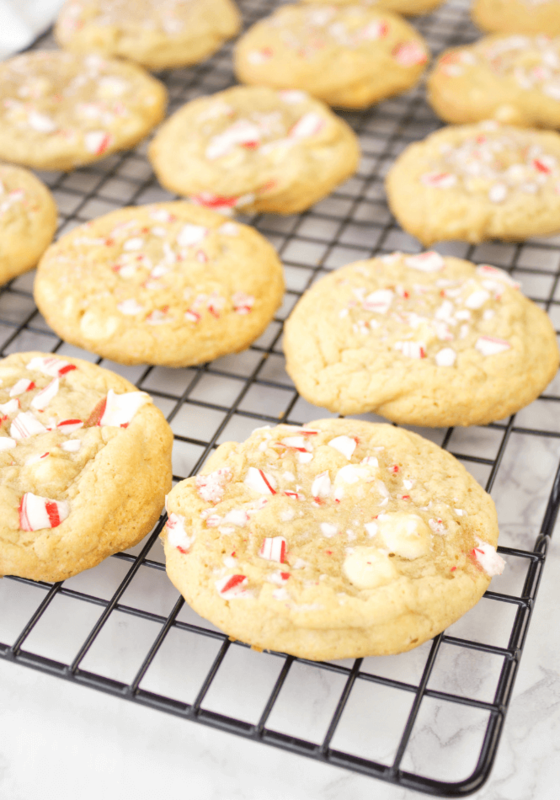 Place candy cane bits on the top of each cookie. I like to just dunk the top of the cookie into the bag of crushed candy canes and place back onto cookie sheet. Bake for 10-12 minutes. Let cool on a cooling rack and serve. Make sure to place the cookie dough back in the refrigerator between batches to stay cool. Place candy canes into a storage bag. Use a rolling pin or something similar to crush the candy canes into bits. In a large mixing bowl, add softened butter, brown sugar and granulated sugar together. Use a hand or stand mixer to beat until creamy and smooth. Add the vanilla extract and eggs. Beat again. Dissolve the baking soda in the hot water and add to batter. Use a hand or stand mixer to beat while slowly adding in the flour. Place dough in refrigerator for 30 minutes. Use a cookie scoop to place batter onto baking sheet giving space between each cookie. Place candy cane bits on the top of each cookie. I like to just dunk the top of the cookie into the bag of crushed candy canes and place back onto cookie sheet. Let cool on a cooling rack. 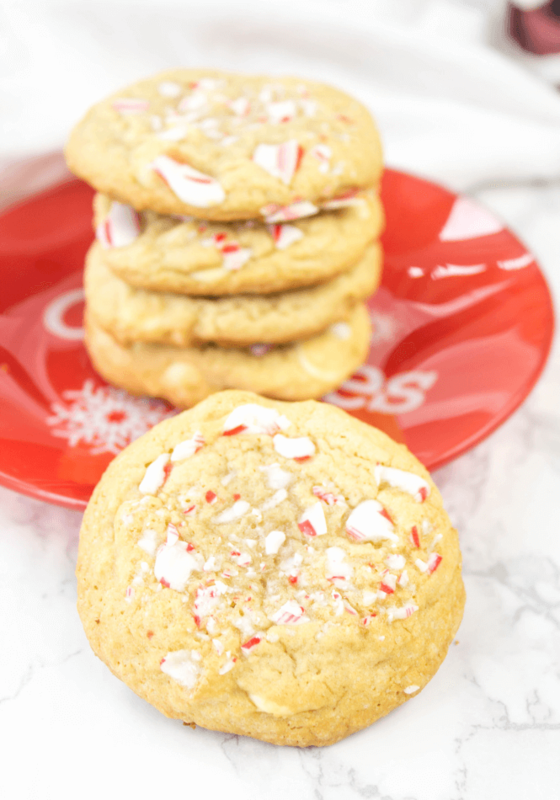 What are you go-to cookies for Santa? Let me know in the comments below! That time of year has arrived again- the time for family gatherings, dinner parties with friends and holiday fun. I am sharing How to Create a Decadent Holiday Dessert Bar that is simple and gorgeous with Edwards Desserts as the star of the table. Holiday hams cooked to perfection, creamy mashed potatoes, casseroles galore, gravy on everything…. … are you hungry, yet? I am sure am. Holiday food is the best kind. Indulgent, comforting and filling. No holiday is complete without a spectacular dessert to top off the night! Creating a decadent holiday dessert bar is easier than you may think and I am sharing just how to do it. 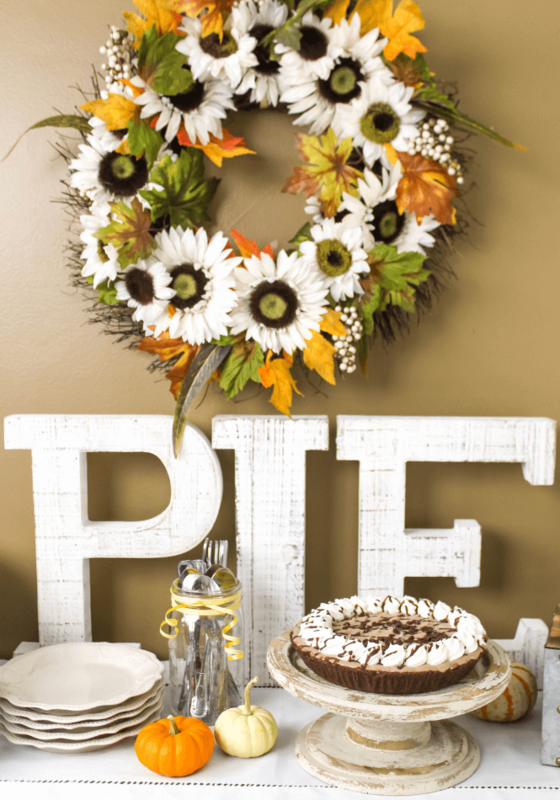 Start by picking a theme for the dessert bar that coincides with your gathering. My theme was Bright Autumn with a lot of white but pulling in those beautiful fall colors with subtle oranges, gold, greens and browns. 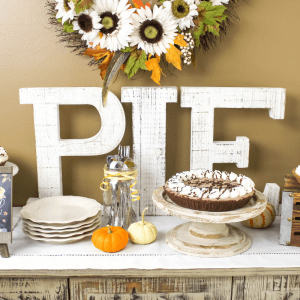 I found the letters P, I, and E at a local craft store and they are the perfect touch to the table so everyone knows this is the dessert spot. 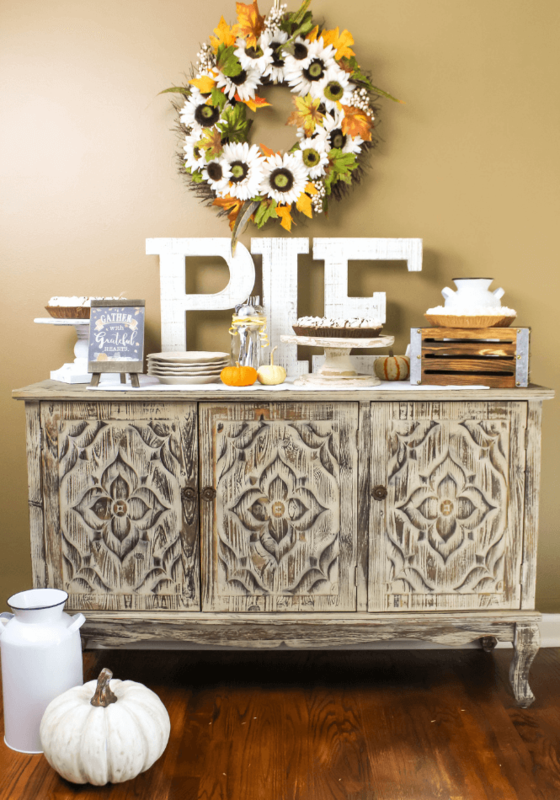 Pick a spot in your home that is convenient to where you are entertaining to set up your dessert bar. I picked the buffet in the dining room to give everyone a little tease during dinner. A little motivation for the adults to save room for dessert or for the kids to eat their veggies couldn’t hurt, right? Decor – keep the decorations simple while aligning with the theme. No need to go overboard. 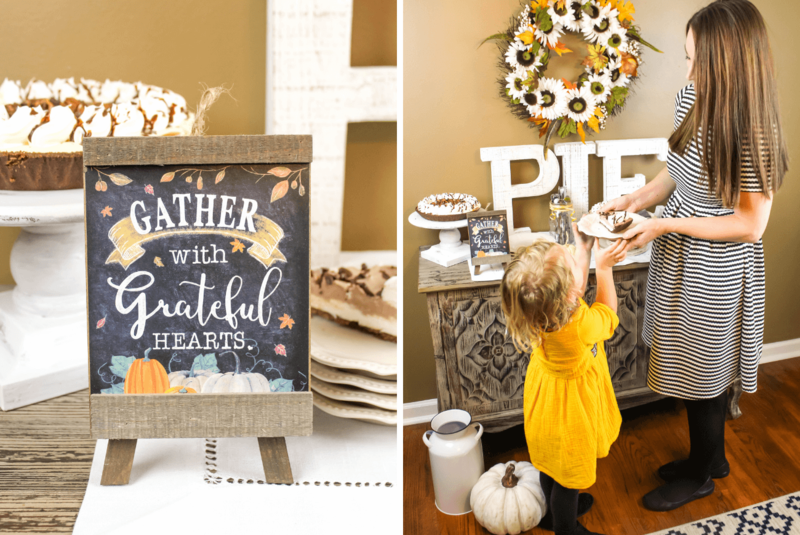 A miniature sign and pumpkins alongside the wooden letters to spell out P-I-E was all it took. Plates – a plate for every guest. Silverware – mix of spoons, knives and forks. 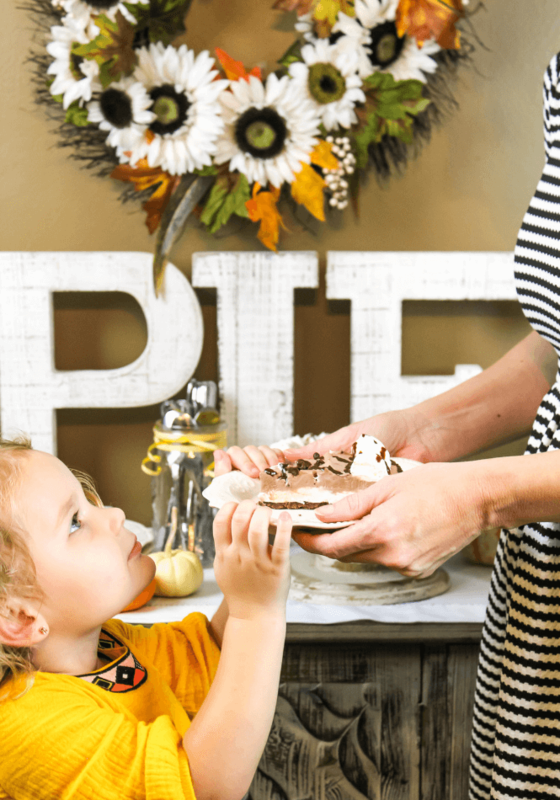 Pie Server Utensils – one for each pie for serving. Cake Stands – cake stands at different levels to set the pies on add a nice design element. Think about cake stands out of the box too! One of my stands is a small wooden crate flipped over. Flowers – flowers are the easiest way to add color into a space. I used an Autumn wreath with fake flowers but even a vase with fresh sunflowers would be a great touch. 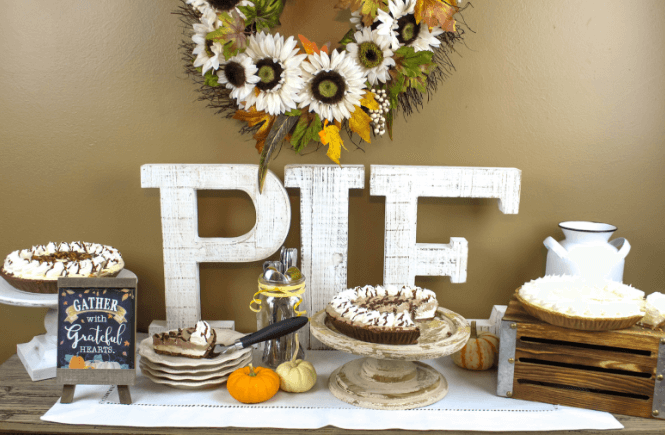 Delicious Desserts – pick a variety of pies to please everyone. Hosting holidays and social gatherings can get a little crazy! There is plenty to do and don’t think you have to make everything homemade from scratch and spend days cooking. Save some time and energy with pre-made items like Edwards pies that offer a homemade taste without all the effort. 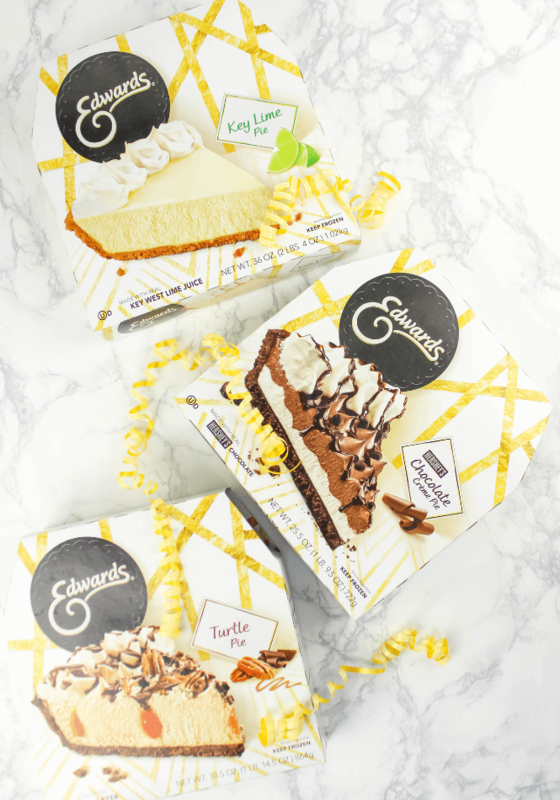 Edwards makes dessert time so convenient and so darn delicious. 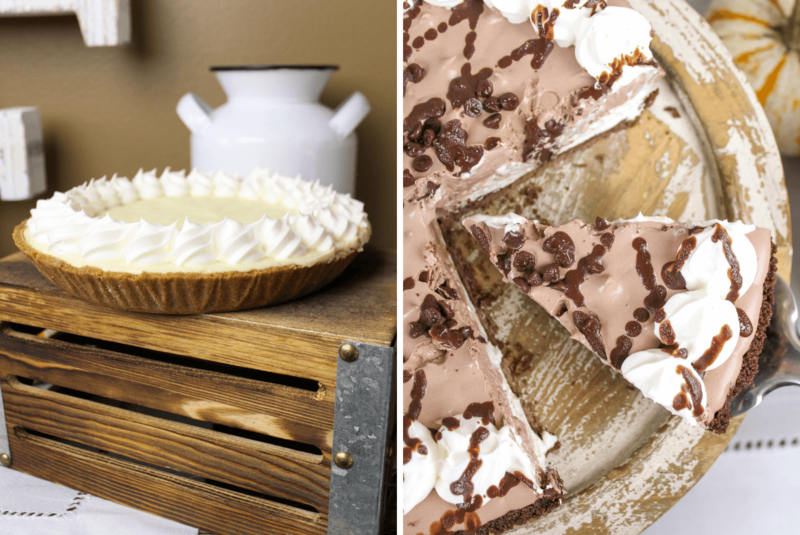 With pie flavors like Key Lime, Turtle or Chocolate Crème- you are certain to please all your guests (once they figure out which one to start with). 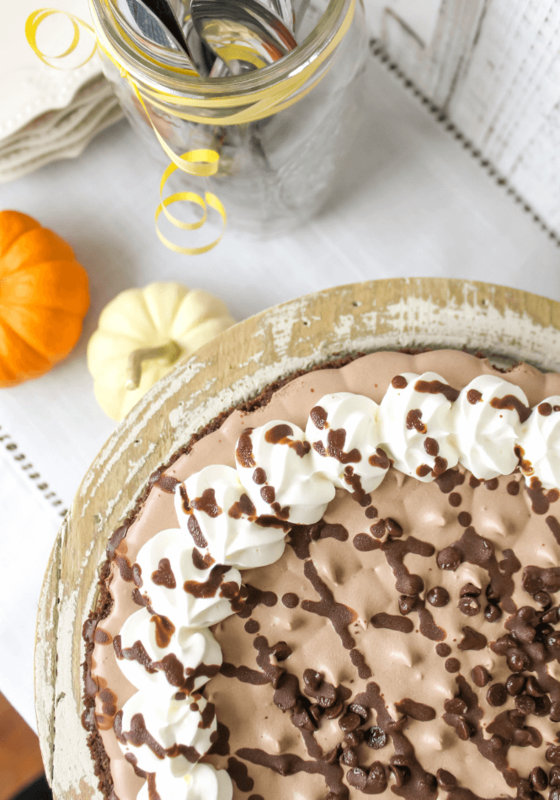 Edwards Hershey’s® Chocolate Crème Pie – Chocolate lovers rejoice with layers of chocolate and vanilla crème topped with chocolate pieces, chocolate drizzle on a chocolate cookie crumb crust. 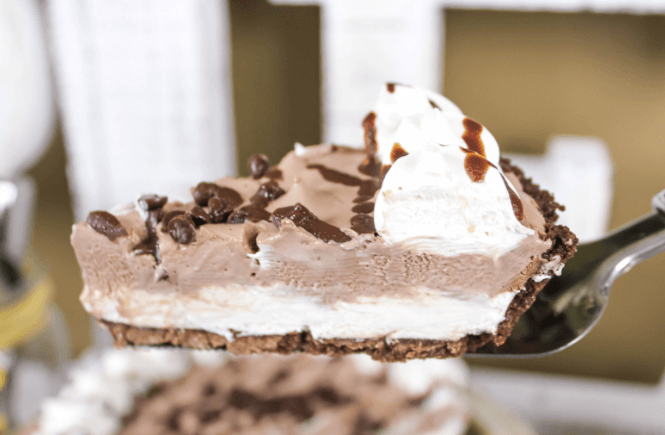 Edwards Turtle Pie – Smooth caramel filling topped with chocolate and pecans on a chocolate cookie crumb crust. Edwards Key Lime Pie – Your taste buds deserve a vacation. Key lime filling with real Key West lime juice on a vanilla cookie crumb crust. Edwards Pumpkin Crème Pie – Look for this seasonal decadent dessert as well. Velvety layers of real cream cheese and pumpkin spice on a vanilla cookie crumb crust. Don’t let the stress of the holidays get you down. My 5 best hosting tips will help you get through it all and leave a smile on your face. Plan out your holiday gathering. From the guest list to menu, write every detail down. Go with what you know. Don’t whip out a brand new recipe book to cook from the day of! Cook the dishes you know already and keep it simple. New recipes should be tested weeks in advance. Make what you can in advance. Rolls, gravy, cranberry sauce and mashed potatoes are all great items to make ahead of time and freeze. Buy some pre-made items. Go with brands you trust for some pre-made items like Edwards Desserts. Ask for help. Don’t feel like you have to do everything because you are the host. You can ask guests to bring particular dishes or ask a few people to come over the night beforehand to help you prep. People like to contribute so don’t be afraid to ask for a little help. Whatever your holiday plans may be and with whoever you may celebrate them with, a beautifully decadent holiday dessert bar is always a good idea! 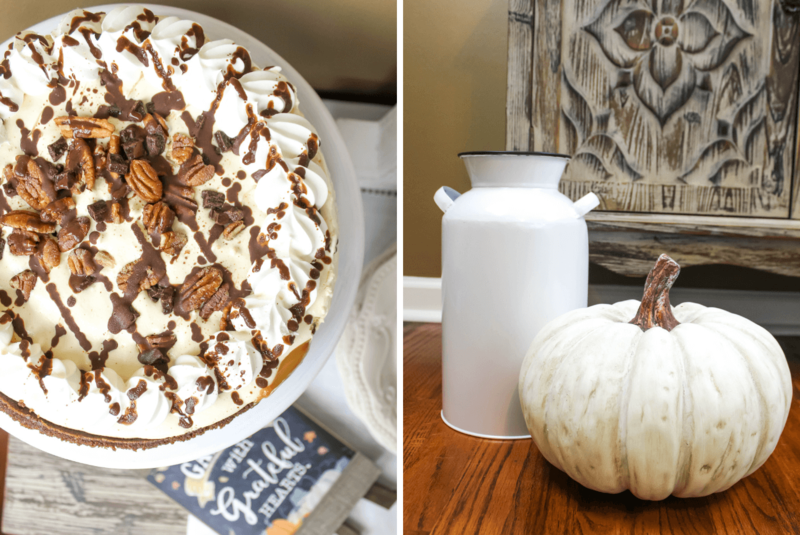 Let me know about your holiday plans in the comments below and how Edwards Desserts will help make this season’s entertaining a breeze. 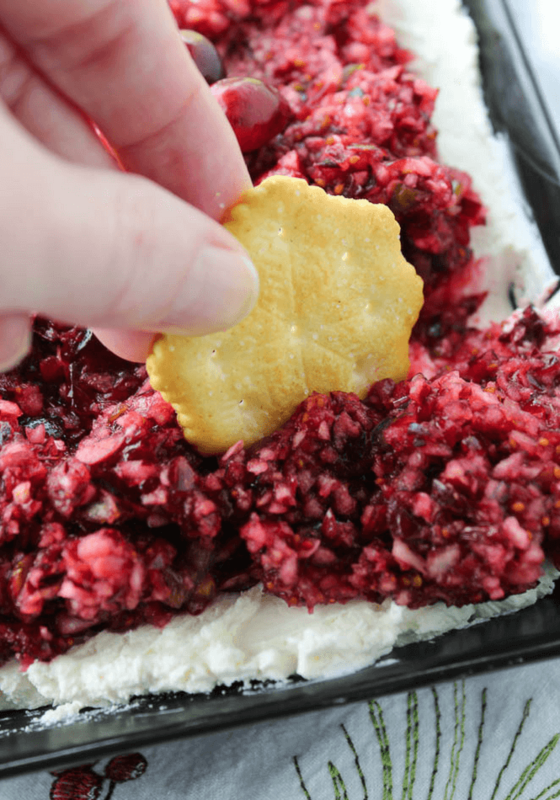 Cranberry Poblano Relish and Cream Cheese Dip made with fresh, uncooked cranberries, poblano pepper, brown sugar, cumin, coriander and brown sugar placed on top of cream cheese for a simple and flavorful dip. It is time for Recipe Swap Club again and this month I was tasked with Fix Me A Little Lunch with Ali. Ali lives in Oregon, where I was raised, and she is a member of the Community Supported Agriculture where she gets to visit local farms and learn more about local produce. A lot of Ali’s recipe are based on local fruits and vegetables and there are drink recipes galore! Visit Fix Me A Little Lunch and see the original recipe! I wasn’t aware of this but a large percentage of cranberries produced are from Oregon and this time of year, cranberries are everywhere! You can’t have a Thanksgiving or Christmas dinner without a cranberry dish. 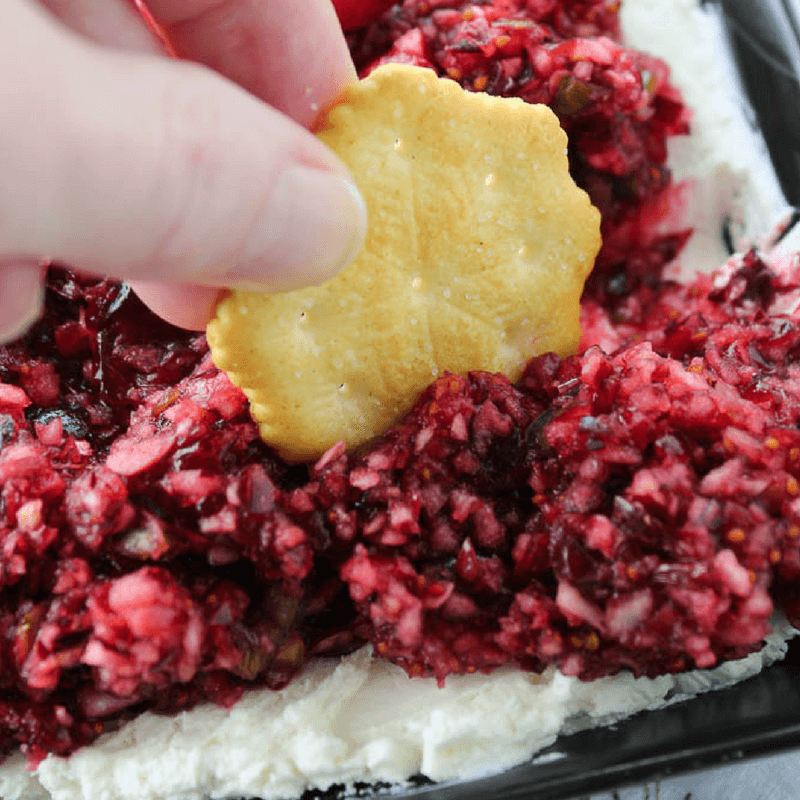 I chose to make this Cranberry Poblano Relish and Cream Cheese Dip using Ali’s relish recipe for the simplicity, spice and in spirit of the season. 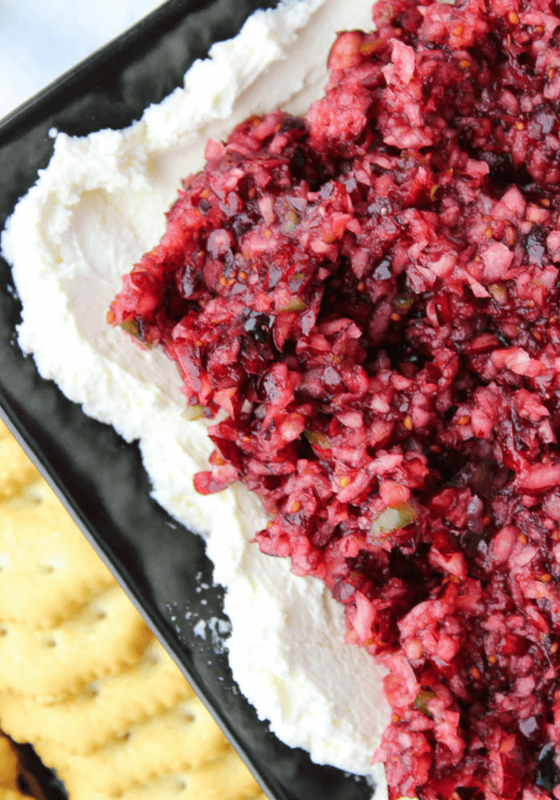 This Cranberry Poblano Relish goes beyond a cream cheese dip. Spread it on a sandwich or place it on some crackers with brie cheese. It is really delicious and makes your mouth do that little happy food dance. Be aware that this is a bit spicy so if you are serving a group of people, think about doing a second dip for those non-spice lovers (hey, they exsist). 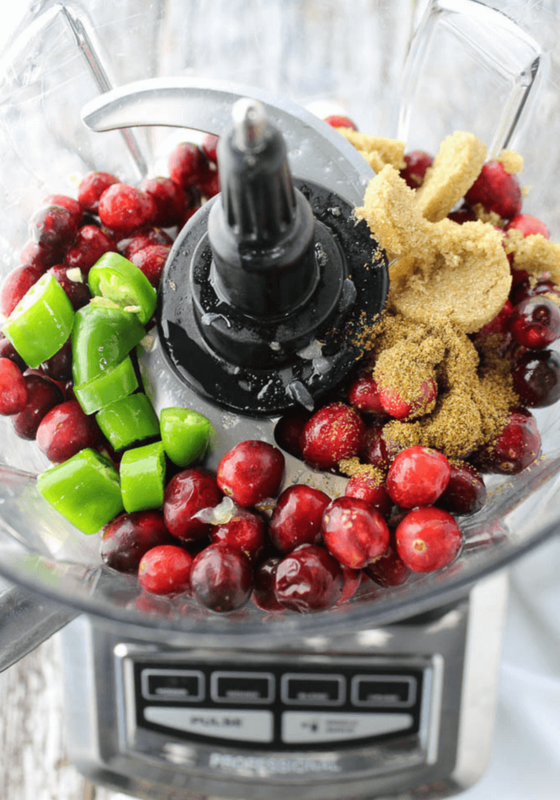 Place cranberries, poblano, juice of 1 lime, cumin, coriander and brown sugar into food processor. Blend until all ingredients are finely chopped. Spread cream cheese into a serving bowl. 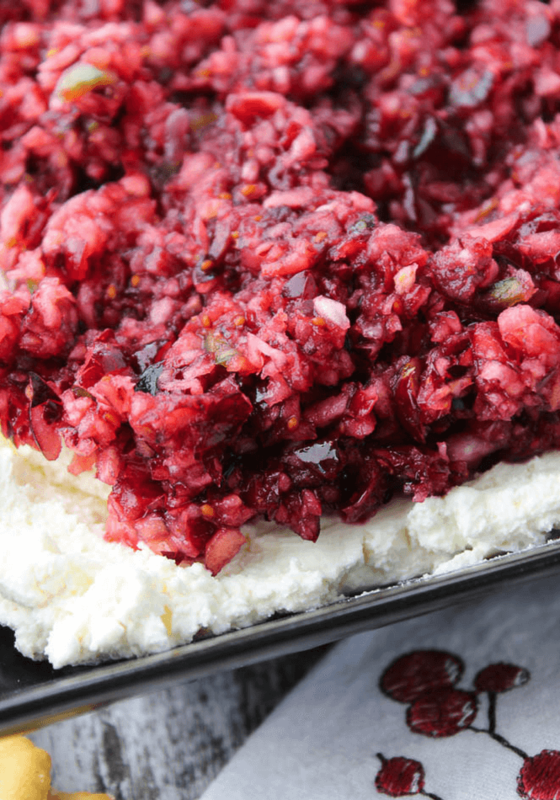 Spread the cranberry poblano relish on top. Serve immediately or cover and place into fridge for 24 hours for the flavors to soak. Serve with crackers of choice or baguette slices. 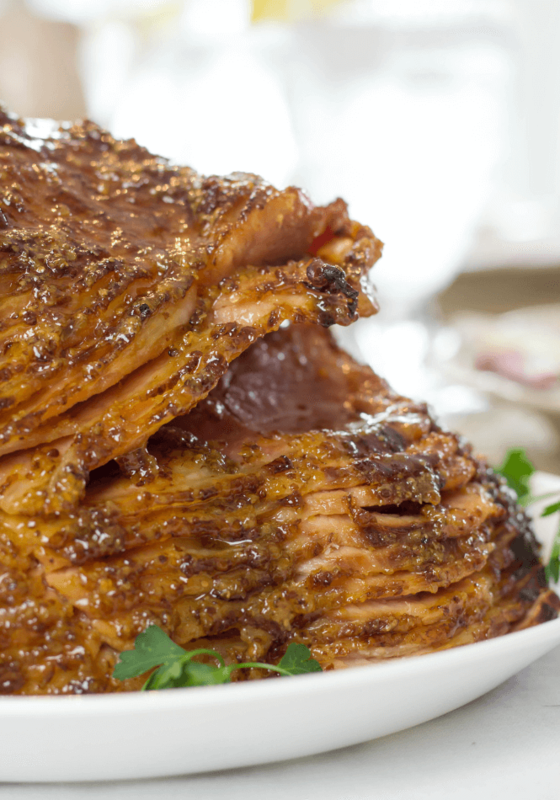 Slow Cooker Honey Pineapple Holiday Ham is a must have recipe for holiday parties. 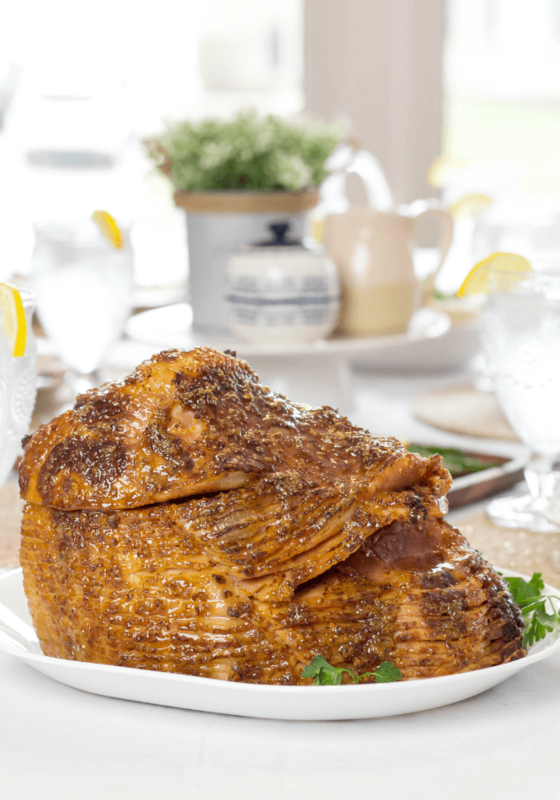 Thanksgiving, Christmas, Easter or any get together is a perfect occasion for Slow Cooker Honey Pineapple Holiday Ham! Occasionally, I even throw this ham in on a Sunday afternoon so to make ham sandwiches for the week’s lunches or a Slow Cooker Ham and Bean Soup. This recipe is inspired by my grandmother. My grandmother would always make ham with brown sugar, honey or mustard and pineapple slices. She would cook hers in the oven and I prefer the crockpot, especially if you have a turkey and casseroles going in the oven then there just isn’t much room for a ham. The crockpot also lets you cook the ham on a low temperature for a longer time to ensure the juices are soaking in. Pick a pre cooked ham that is 8-10 pounds and I prefer to buy with bone in so I can make a soup with the leftovers. A ham over 10 pounds may be difficult to squeeze into your crockpot so keep that in mind. Make sure to buy a spiraled pre sliced ham also so the flavors of the honey, pineapple, and brown sugar can really soak in and give you a really tasty ham. I always recommend buying locally made honey, especially if you suffer from seasonal allergies. Honey is known to help with pollen sensitivities when consumed on a regular basis. I think this is a controversial topic in regards to honey helping fight against seasonal allergies but I believe it and always buy local. Plus, you are helping support a small business in your community which is always a great idea. You may also want to try this Slow Cooker Orange Marmalade Ham for a perfect centerpiece for your holiday dinner. Add 1.5 cups brown sugar to the bottom of the crock pot. Add .5 cup honey. I eye ball half a cup and drizzle over the top of ham. Add the other 1.5 cup of brown sugar. Place pineapple slices on top of ham and you can hold them in place with toothpicks if you wish. Add the remainder of the juices of the pineapple can into crock pot. Cover with foil ad place lid on top. Cook on low 3-4 hours. Simply Made Recipes is a participant in the Amazon Services LLC Associates Program, an affiliate advertising program designed to provide a means for sites to earn advertising fees by advertising. If you click on an affiliate link and make a purchase, we may receive a small commission. This costs nothing extra to you and helps keep Simply Made Recipes running! Spiked Candy Cane Hot Chocolate with candy cane infused vodka and a simple white chocolate hot cocoa perfect for a cold winter day or holiday party. The white chocolate cocoa is creamy and blends perfectly with the candy cane infused vodka. Fa-la-la-la-yum-oh! Spiked Candy Cane Hot Chocolate was created to use up the rest of our candy cane vodka from those Candy Cane Infused Vodka Chocolate Martinis a couple weeks back. We are not big drinkers so alcohol lasts forever around here and I wanted to create another drink with that delicious candy cane infused vodka! This recipe is great because 1) tastes amazing and 2) you can make the kids their white chocolate hot cocoas while the adults get their spiked version with candy cane infused vodka. Its fun to garnish with a candy cane and some marshmallows. The grocery store had some cute snowman candies that we put on top and the kids thought it was hilarious. A few days before making a Spiked Candy Cane Hot Chocolate, you will need to infuse the vodka. Decide how much you will need. Let us go with liter measurements today. Pick out a liter of vodka. Higher quality vodkas will infuse better and make the overall drink taste smoother. I typically just go for a mid priced vodka like Grey Goose. For one liter of vodka, you will want 15 tiny candy canes. Unwrap each candy cane and put into vodka bottle. Put the vodka bottle to the side and let the candy cane flavor infuse for 2 days. Shake well before using. Never use a plastic container for infusing vodka, you will also infuse the plastic taste. Nobody wants a plastic flavored anything. So, if you are transferring the vodka into another container to infuse, make sure it is glass, like a mason jar. Put 15 tiny candy unwrapped candy canes into liter of vodka and let sit for 2 days. On the stove top in a pot, add 14 ounces of condensed milk, 2 cups milk and 1 cup white chocolate and use whisk to stir until bubbling on a low to medium heat. Add one shot candy cane vodka. Mix and garnish with a candy cane and marshmallows. Celebrate the holidays with a Candy Cane Infused Vodka Chocolate Martini. The perfect combination of peppermint and chocolate for a festive drink for a holiday party or an end of the day relaxing drink… possibly after all that shopping to stay in the spirit. A few days before making a Candy Cane Infused Vodka Chocolate Martini, you will need to infuse the vodka. Decide how much you will need. I had about half a liter of vodka in the freezer. Figuring there are about 23 shots in a bottle. Half a liter would give me about 11 martinis. A full liter would give you about 23 martinis. Since the crème de cacao comes in liter sizes, lets figure on making 23 martinis to make everything come together equally. You can adjust the measurements depending on your needs. Pick out a liter of vodka. Higher quality vodkas will infuse better and make the overall martini taste smoother. I typically just go for a mid priced vodka like Grey Goose. For one liter of vodka, you will want 15 tiny candy canes. Unwrap each candy cane and put into vodka bottle. Put the vodka bottle to the side and let the candy cane flavor infuse for 2 days. Shake well before using. Never use a plastic container for infusing vodka, you will also infuse the plastic taste. Nobody wants a plastic flavored martini. So, if you are transferring the vodka into another container to infuse, make sure it is glass, like a mason jar. I love these drinks for a festive holiday party. They are so simple and beautiful. The recipe calls for both crème de cacao and chocolate milk plus a squirt of chocolate syrup. The chocolate can be adjusted according to your personal taste. I love chocolate! I cannot get enough so the more the chocolate, the merrier I am. You can opt out of the added chocolate syrup or cut back the 2 ounces of chocolate milk and still have a wonderful Candy Cane Infused Vodka Chocolate Martini. Make the candy cane infused vodka by adding 15 tiny candy canes into a bottle of vodka and let sit for 2 days. Shake well before using. Break a few candy canes into very small pieces. I used a Ziploc bag and paddles with a rolling pin. Put broken candy cane pieces on a plate. Grab a second plate and pour chocolate syrup on it. Take martini glass and dip brim into chocolate syrup followed by dipping brim into the broken candy canes. In a cocktail shaker, add ice, 1.5 ounces candy cane infused vodka, 1.5 ounces crème de cacao, 2 ounces chocolate milk, and 1 squirt chocolate syrup(optional). 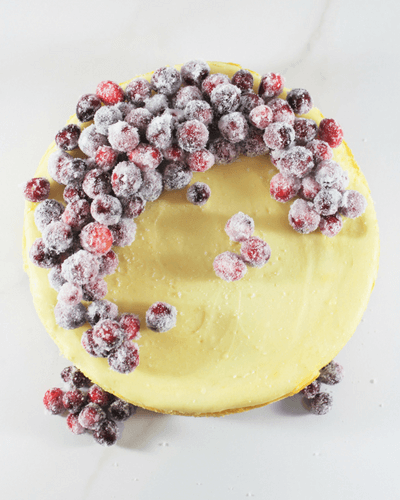 Sparkling Cranberries White Chocolate Cheesecake is a gorgeous holiday dessert. I love, love, love cheesecake and if you have followed me for awhile you probably have noticed this fact. 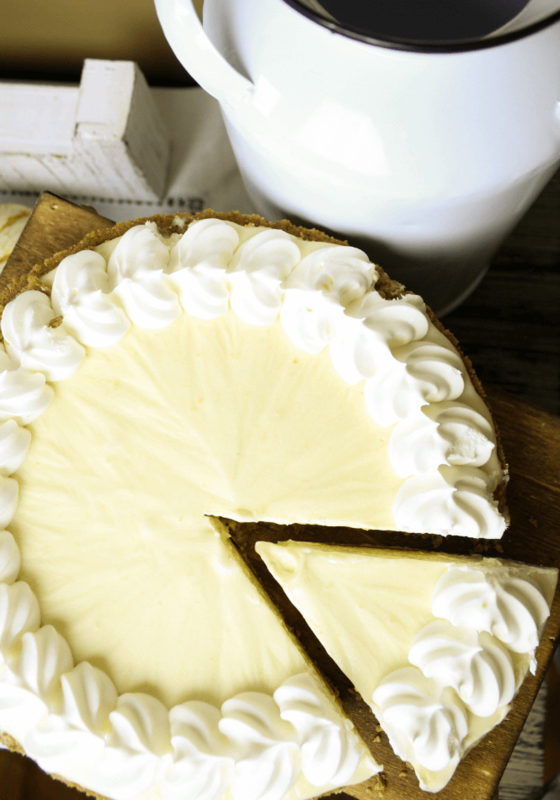 The white chocolate cheesecake is so simple and has minimal ingredients with a nice homemade graham cracker crust that is amazing on its own. 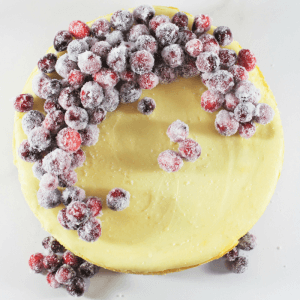 Add in the sparkling cranberries that are juicy and sweet for that ideal treat for a holiday party. I feel like the photos don’t even show you how pretty this cheesecake even is. The sparkling cranberries are so fun and sparkle so beautifully. You can arrange the sparkling cranberries however you please or even have them set into a pretty bowl on the side for everyone to add their own or even just snack on like my children love to do. You can use these cranberries for other recipes, too. They look amazing in holiday drinks. You can even serve a simple vodka cranberry or kid friendly punch with sparkling cranberries for a garnishment. I know I have said this before but I will mention it again. 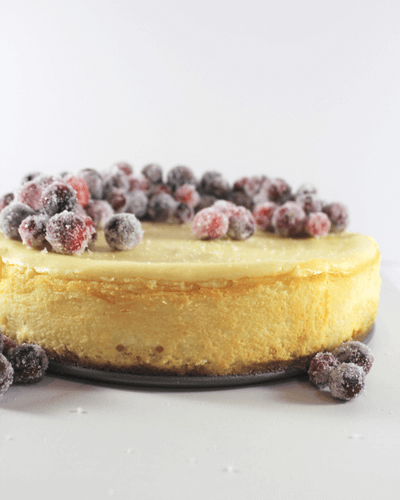 The trick to a perfect cheesecake is simple. Make sure the cream cheese has been sitting out a little bit to warm up before mixing so it turns out smooth and doesn’t have any chunks in it. Also, wrap the edges in foil to avoid burning. Gather ingredients, 4 mixing bowls, hand mixer, measuring cups and spoons, large ziplock bag, pot and springform pan. Let the cream cheese and butter stay out for an hour to get it close to room temperature. Start the simple syrup for the cranberries. In the pot, add 1 cup granulated sugar and1 cup water and heat until sugar is dissolved. Set to the side for 5 minutes, then add the cup of cranberries. Let cranberries sit for at least 2 hours. I let them soak overnight while the cheesecake chills. In the large ziplock bag, place one sleeve of graham crackers. You can use anything to paddle the bag to break up the graham cracker. We use a rolling pin. Place crumbs (1 1/4 cup) in the bowl with 6 tablespoons of room temperature butter and 1/4 cup of sugar. Mix with hands and place into the springform pan. Work the crumb mixture until nice and even. You can just put the graham crust on the bottom of the pan or you can also come up the sides. Start the cheesecake mixture. Add 2 pounds of cream cheese (room temperature), 3/4 cup sugar, 1 teaspoon vanilla extract together and use your hand mixer to make creamy and consistent. Melt your white chocolate. I do this by microwaving for 30 seconds at a time, stirring between intervals until it is completely melted. Add the melted chocolate to cream cheese mixture and blend well. Add one egg at a time and blend until everything is creamy. Add this mixture on top of crust. Cook cheesecake for one hour. Take a knife to loosen the cheesecake from the pan. This part I am always terrible at and I cannot after the many, many cheesecakes I have made, get the sides perfect. Refrigerate for minimum of 4 hours, although I just let it sit overnight. Release from springform pan. Drain the cranberries. Put 1 cup of fine sugar into a bowl and add a handful of cranberries at a time. Shake the bowl to get the sugar to coat each cranberry and then put to the side and repeat until all cranberries are complete. I recommend the fine sugar for this step because it will coat the cranberry much better than a regular granulated sugar that you use for baking. 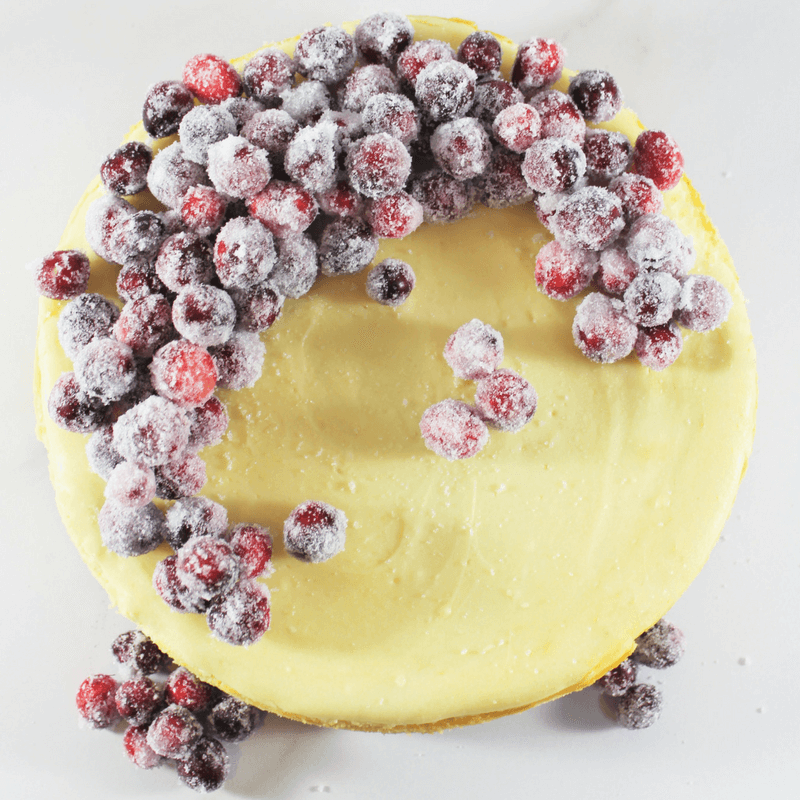 Decorate the cheesecake with the sparkling cranberries and serve.